Here’s an example of superb customer service, provided last night by Alex Gonzalez, Weekend Manager of Pueblo’s Mexican Cuisine restaurant on Dawsonville Highway in Gainesville, GA.
My wife Sandra and I dine there often after catching a Sunday afternoon movie nearby. This time Heather, a rather new server, took our order. When she brought our beverages, I told her that mine was not what I had ordered. She assured me she had heard me correctly. Very politely, I asked her to check with the manager. In fairness, I offered to keep what she had brought if the mistake was mine. Also, I asked her what it would cost to get the drink I wanted. After chatting briefly with Alex, she assured me they would replace the unwanted drink with what I preferred, at no cost. I thanked her, after making sure I had not caused her or the manager a problem. 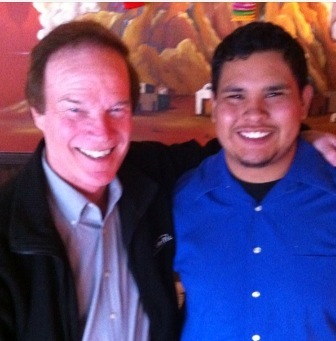 After the meal, I introduced myself to Alex, explaining that I have taught customer service seminars for a variety of groups nationwide–and that the next time I direct a seminar, I will describe his gracious solution to the confusion about my order. Additionally, Alex allowed Sandra to take our photo, and granted permission for me to feature him in this blog. –He could have insisted I pay for the drink Heather brought me. Yes, that might have saved Pueblo’s two or three dollars. That would have been going by the regulations. –Alex let respect guide his decision. He respects customers who gave an unintended order. He respects servers who might have misunderstood an order. –We talked about the long term value of a customer. If he had charged me for the drink substitution, I might not dine there again. Over a year, that would amount to several hundred dollars in lost revenue for Pueblo’s. 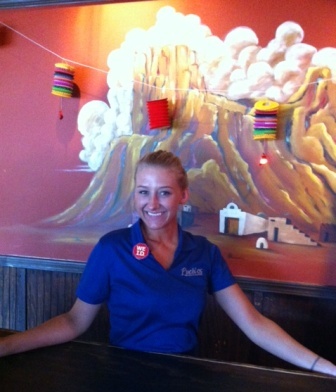 –Alex knows that he upheld Pueblo’s image as a friendly, supportive place to enjoy food and hospitality. –As a result of substituting respect for regulations, Alex prompted me to tell you and other readers about this fine experience. Owners and managers and customer service representatives who “win” a dispute with a customer may save a few dollars then. However, company representatives who respect the customer, as Alex did, not only keep the customer coming back–they’ll notice the customers’ friends start showing up too.